As contract talks between AT&T and unionized workers continue without resolution, the threat of a walkout looms. File photo by Luke Thomas. Such action could result in widespread disruptions to electronic communications and commerce. AT&T claims its wireline business is shrinking and seeks concessions from wireline employees in lieu of layoffs to make up for falling profits. AT&T’s proposed cuts include slashing overtime while increasing employee health care and pension contributions. 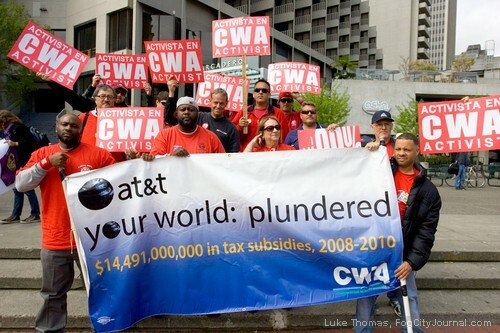 Workers, who have been working without a contract since April 7, say AT&T is being disingenuous; that while demand for some wireline services is decreasing, AT&T’s wireless and U-Verse segments continue to grow, contributing to an overall increase in revenue and profits for the nation’s largest wireline service provider and second largest wireless service provider. As failed negotiations between AT&T management and CWA continue, tensions and frustrations are on the rise. Warren Pierce, an AT&T cable splicer, commented that not knowing what’s next is frustrating. 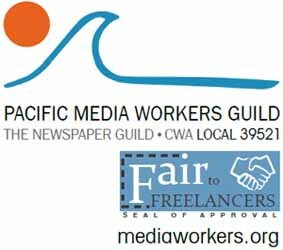 “We’re a communications company and no one’s talking,” Pierce said, adding that workers should already be on strike. AT&T reported net income of $3.6 billion in the first quarter of 2012 on revenues of $31 billion (up $575 million), a 5.2 percent increase over the same quarter in 2011. Total revenue in 2011 was $127.3 billion. While AT&T workers ponder why an increasingly profitable business refuses to realign and protect its workforce while adjusting to shifts in service demands, AT&T continues to maintain worker concessions are needed. AT&T leads the communications industry in wireline revenues and is only slightly behind the number one wireless company, Verizon. Verizon posted net income of $3.9 billion in the first quarter in 2012. (Sprint reported a net loss of $866 million in the same quarter). Although AT&T’s wireline segment realized a .08 percent decrease in operating revenues, the communications behemoth reported $15 billion in total revenues. The decrease in operating revenues is attributed to a decline in business customers. Its consumer customers increased, however, offsetting the loss. And while broadband connections remain stable with 16.5 million connections, demand for AT&T’s U-verse continues to grow. AT&T reported a 60.9 percent increase for its high-speed U-verse internet service. AT&T contends it wants to protect its employees. “The average AT&T network technician in these contracts makes $90,000 in wages and $43,000 in benefits; the average call center rep makes $67,000 in wages and $40,000 in benefits,” Richter said. Givens and CWA Local 9423 President Stephanie Olvera, an AT&T employee for 47 years, scoffed at the income figures AT&T has publicly released during the bargaining process, saying they are inaccurate and misleading. After 30 years working for AT&T, Givens, 51, said he is in the top wage bracket for wireline employees and makes $70,000 per year. Although a good wage, it is not what the average employee earns, he said. While many employees receive good benefits under the old contract, the monetary value is an AT&T corporate assumption. It’s misleading to the public, Olvera said. Yet, lowering wages and limiting benefits like healthcare and pensions has had a drastic, negative consequence for workers and, by extension, the U.S economy, leading to a rise in economic inequality, according to Jacobs. In California, the current trajectory estimates 40 percent of all workers will be at or near poverty in retirement, according to a recent study by the Labor Center. And as workers feel more and more squeezed by corporations like AT&T, the threat of strike action becomes inevitable. Comments for AT&T Strike Threat Looms are now closed. What is killing customer service is the corporate cost cutting attitude that runs rampant at AT&T. The unfriendly ivr, the constant price increases, and the unacceptable hold times. AT&T prefers poorly trained, outsourced vendors to highly trained, experienced employees. The push is on sales, and no matter how unethical the vendors are, they are making AT&T the most money. Then it takes a skilled union worker to fix the problem the non union vendor created. And AT&T wonders why customer service numbers are down? AT&T just wants to create the illusion that they care about customers. The only thing corporate really cares about is the money in their suit pockets. AT&T blowing smoke as usual. Yes, revenues for plain old telephone service are down as stated. Unsaid is the fact that wireless & U-verse service are provided via the same network of cable & fiber & are constructed & maintained by the same people who take care of POTS. The condition of the outside plant has become more important as bandwidth requirements increase.This means that there is a greater need for technicians in the field. It’s only “wireless” from the cell site to you, it’s copper or fiber cable from the cell site to the central office & always will be. Amazing that AT&T keeps that POS ceo around, yano, the one who whizzes away $3-$4 BILLION on botched deals ~ all while demanding workers give huge concessions. The ceo who is screwing retirees by demanding huge premiums for health care. These retirees went to work at AT&T because they were taken care of, to now change the rules after the game has been played is just WRONG! Come on AT&T, it’s time to make things happen. There is no reason to disrupt service with skeleton crews in order to send anti union messages. The business is thriving. Service is excellent. Nobody wants a strike, this is unnecessary. I already pay a hefty health care premium as a retiree after 31.5 years of excellent customer service and always met or exceeded standards set by my employer. Please make good faith contract and continue the smooth service without all the disruptions of replacement workers and putting off customers, who will go elsewhere.